These are the questions asked of the muse of storytelling by poet Sunni Patterson. She asks them on behalf of a new interactive documentary and advocacy project, Land of Opportunity. How does one begin to tell of the end? Especially when the user might choose Downtown Brooklyn as their entry point over the video of Patterson’s passionate lines spoken slam-style while walking past vacant lots in New Orleans’ Ninth Ward? Luisa Dantas, the director of the platform, began to tell this story with Land of Opportunity, the feature documentary film. 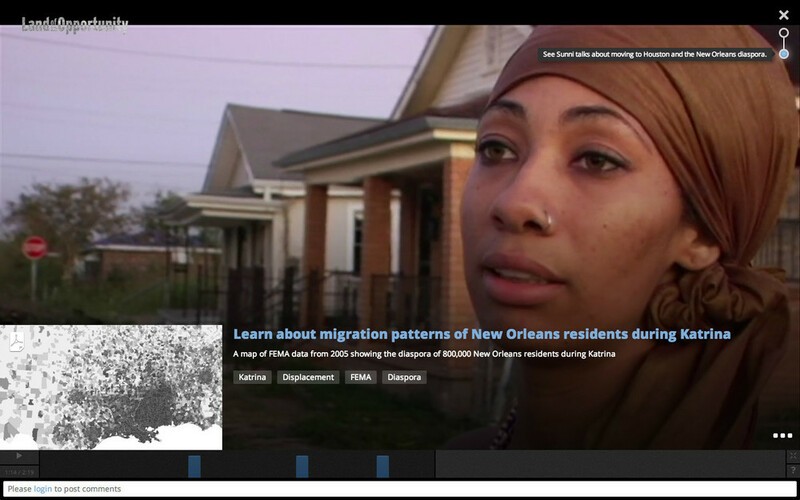 Immediately after hurricane Katrina she began gathering footage and interviews with people associated with the initial recovery: ACORN organizers, public housing advocates, dislocated teens, and immigrants riding the boom of construction and debris removal jobs. The movie takes a look at the opportunities provided in the wake of disaster: some wasted, some fulfilled, and others possibly exploited. How does one begin? One answer is, simply, move away from an ending. The website features four binary category heads like “Exclusion/Engagement” and “Dislocation/Home.” Each section asks a question as a prompt, then answers it with different chapters of video, but not all of it comes from Dantas and her New Orleans-based team. Content (and questions) are also supplied by collaborators from other cities. There’s Kelly Anderson, for instance, whose film My Brooklyn examined the transformation of a neighborhood economy into a destination-based retail sector in the mid-2000s. There’s also a segment by the New Orleans Council on Open Governance that explains how participatory budgeting has worked in other cities and to what ends it could be applied locally. While the site allows users to skip around and view different perspectives on the issues, it isn’t a simple presentation of thematically-related films. “It’s more the site allows us to view and collaborate and compare and contrast material in the way a film would never let us do,” Dantas said. One way the site attempts to present the truth that lies belly up is through cross-referenced content. As a longer video plays, it triggers access to connected content--articles, photo collections, personal videos, etc. This isn’t just a ploy to get the user to sit all the way through a segment; the triggers each correlate directly to something mentioned in the video. For those afraid to click into a rabbit hole, the site provides a “breadcrumb trail” that will lead users back through the layers. While the extra content is not all created equal, they at least offer up evidence that cause and effect are better thought of as crystalline structures rather than linear models. Spend enough time with the site, and the parallels between cities become clear. For instance, one segment tells the story of a particularly ironic move by the city government in New Orleans that “preserved” historic homes by relocating them out of a demolition area to an unoccupied field, open to the elements. After a conflict arose with the companies contracted to do the job, the city put the homes on the backburner, leaving them unused and unprotected. Eventually, the structures were “un-blighted” by artists who turned them into a large scale art project. The video triggers several links to more detailed articles, but also invites the user to see how Rio de Janeiro and Chicago have used art to deal with urban blight. “There is a lot of cultural context that might be different, but at the core, these dynamics are playing themselves out everywhere,” Dantas said. But is the Land of Opportunity site really just an elaborate way to describe problems and converge content by like-minded groups? It could be seen that way if a user’s interaction with the site was brief or tentative. There is a focus on victims and victimhood in both the film and the website, but only as a transitive phase between inaction and action. Land of Opportunity avoids becoming just a transmedia exhibit of despondence by celebrating successful community efforts. Dantas wants the next step for the site to involve future partners who don’t have an experienced code monkey on the payroll. Because the site is built on open-source elements, adding on content won’t require massive changes to the site’s architecture. Land of Opportunity received support from the Mozilla Foundation, and serves as a high-profile proof of what Mozilla’s Popcorn video annotation engine is capable of. So how does one end? With awareness that we are always at a new starting point with the chance to advance or relapse. Read about another interactive documentary dealing with rural equity as opposed to urban issues, Hollow. Ryan Sparks is a writer and editor living in New Orleans. To keep up with him, follow him on twitter.